We lay Dad to rest in Forest Hills Cemetery in Piqua, Ohio, on a bitter cold morning, the frozen grass on the hard ground crunching beneath our boots, and our breaths visible in front of us as small puffs of mist. Under a tent, Dad’s coffin waits on a stand above his grave, near the turned earth of Mom’s fresh grave–two weeks old. A tombstone bears the name Smith in all capital letters, with three individuals identified below. Diane Louise “Annie” 1958 – 2009 is engraved in the middle; and Mary K. 1934 on the right, her death date not yet engraved in stone. Jerry A. 1933 is engraved on the left, near where his coffin waits. Young soldiers in parade dress and white gloves unfold a flag and drape it over Dad’s casket, checking to make sure it is precisely aligned. The colorful stars and stripes and flowers in arrangements brought here from the funeral home brighten the otherwise monochrome winter landscape. The white carnations, in the arrangement with the red roses that my sisters and I picked out, remind me of the flowers Dad bought us to wear every Easter when we were young. The fragrance of white carnations always does. A short distance away eight stoop-shouldered men in dark overcoats, scarves, and warm hats stand shoulder-to-shoulder with guns, the rifle butts resting on the ground. Unlike the soldiers in uniform, these guys look like they could have served during the Korean War, maybe even fought in it. Perhaps one of them left town on the same bus as Dad all those years ago. They raise their rifles, aim into the air and fire. The shots crack the silence of the cemetery. Dad would have loved the rifle salute. A soldier holding a bugle steps forward, raises his instrument, and the wailing notes of “Taps” pierce the air. In the end it all happened so fast. The surprise was that Mom’s health gave out first. Six weeks after a cancer diagnosis and she was gone. That fast. Dad died exactly two weeks later from pneumonia, the inability to swallow, Alzheimer’s–we don’t know exactly. Some said he died of a broken heart. Two soldiers step to opposite ends of Dad’s coffin, take the corners of the flag in their gloved hands, and fold it lengthwise. The soldiers lift the flag, snap it taut between them, and step together as they fold the cloth end-over-end into a neat triangle, smoothing and tightening as they go. One of the soldiers steps to my eldest sister, Kathy, and hands her the sharp folded triangle. Had Dad not asked me, on more than one occasion, “When are you going to write my story?” I would never have interviewed him. And had I not interviewed him, I just might have missed it–the importance of the military to him. I really wish he could have seen this. My sister hugs the folded flag to her chest. We turn away and crunch back over the frozen grass to our cars, then leave. Just two months before Dad’s death, we were all sitting around Mom and Dad’s dining room table having Thanksgiving dinner. The next thing we know they are both gone. Sometimes life hits you at a fearsome speed. 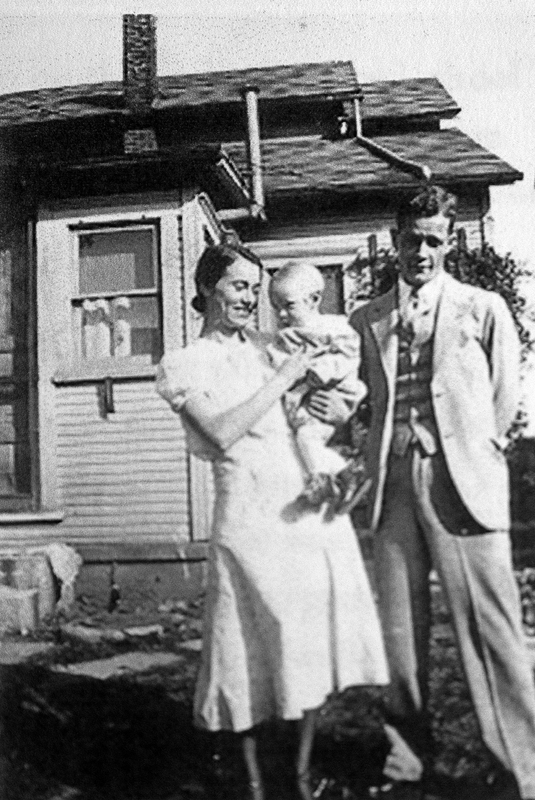 I came in on the 18th day of January 1933, at 715 Manier Avenue, Piqua, Ohio. My Aunt Agnes said that my dad’s mother, my Grandmother Smith, insisted on naming me Jeremiah after my Grandfather Smith. Agnes claimed my Grandmother Wirrig, my mom’s mother, was angry about that. And I might have been named after Jeremiah, but the name on my birth certificate is Jerry Allen Smith. Not Jeremiah. My Aunt Agnes said my mother and my father, your grandparents, met at a funeral. The first I know about my parents was when they were on top of the Hazell Maria apartments on North Wayne. They had dancing up there. My dad always was a dandy. He liked to dress up. He was a pretty good-looking guy when he was young, and he was quite a good dancer. My mother liked to go to dances on the rooftop. I don’t know if they had a live band, or radio, or what provided the music up there. I didn’t come along until a little bit after that. When I was at the age where the likelihood of that happening to me was a real possibility, my Grandmother Smith told me that I shouldn’t be messing with girls. She told me that’s where a guy could get in a lot of trouble–messing with a female.